Log home cob blasting is a process that requires some expertise if it is going to be done correctly. We are hard at work this time of year blasting log homes. 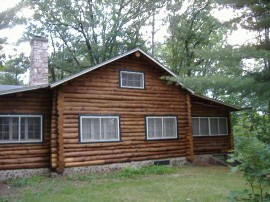 We select from a variety of blasting media when removing the old finish off of a log building. We choose from corncob, crushed glass or sand. 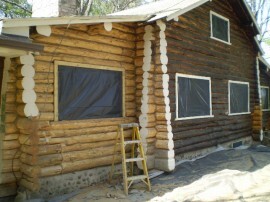 Log homes need to be blasted when the finish becomes faded darkened or is simply pealing off. We have blasted homes that have just about every kind different finish on them: from light semi-transparent finishes all the way to multiple layers of think paint. Dark logs are before blasting was done. When we look at a log home or cabin, we assess the type of finish that is currently on the building and then come up with a recommendation for which media to use. We use corncob on the lightest finishes and areas around metal trim. (Cob is the woody part of the corn stalk, which is ground up and bagged.) We use compressed air to “shoot” it at the building. Most of the time we use a recycled glass material as the blasting media. This glass has a wide range of removal capabilities and leaves the logs very smooth compared to power washing or even cob. The recycled glass material is basically like white beach sand. It is not shards of glass like you might think of as “crushed glass”. Blasting off the heaviest paints still requires sandblasting. In these cases, cob blasting or glass blasting is not suited to the task. The analogy I use when speaking of the different medias we use is likened to sanding wood. If you were starting out sanding a rough-sawn board, you would not start with 220 grit sand paper (corncob) and if you are working on refinishing an oak table you would not use 80 grit paper (sand). Bottom line — one needs to pick the right media for the condition of the logs. We have the expertise to determine this choice and have blasted over 700 buildings in our 40+ years in business. Whether it is log home cob blasting, sand blasting or glass blasting, make sure you are dealing with an experienced company to insure you get the best results.